G Michael Salon in Indianapolis, Indiana was JUST named one of the Top Hair Salons in the Country by Salon Today publications. 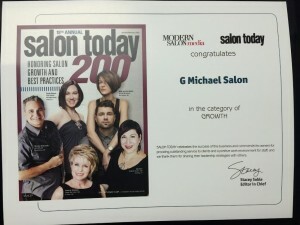 Our team couldn’t be happier and are so honored to be included in this prestigious list of salons around the country. Check out the press release below. business publication for salon and spa owners. salons and spas in the country. Programs; and 29 salons in Technology.